As a Made for iPhone hearing aid, LiNX 3D provides wireless streaming from your iPhone, iPad, iPod touch, and other Apple products, giving you crystal clear access to phone calls, FaceTime, music, movies, and other media, without an intermediary device. For Android users, LiNX 3D is compatible with smartphones through the ReSound Phone Clip + accessory, using Bluetooth. If you find yourself in need of an extra boost, LiNX 3D is compatible with ReSound accessories such as the TV Streamer 2 and Micro and Multi Mics to greater access to sound. 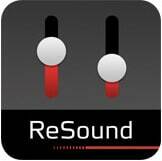 ReSound’s LiNX family of hearing aids was one of the first Made for iPhone solutions available on the market. ReSound has received a number of awards for the LiNX Made for iPhone hearing aid, including the 2016 Gold German Design Award and the Best of CES 2016. Now in its third generation, the LiNX 3D Made for iPhone hearing aid is smarter and more advanced than ever before, paving the way for a brand-new way of treating hearing loss: tele-audiology and tele-health. Tele-health, specifically tele-audiology, might sound like something out of a futuristic sci-fi story or The Jetsons, but it’s here and it’s real! In April 2017, ReSound unveiled this brand-new technology that is designed to provide wearers with the most accurate and advanced listening experience possible. At the Audiology Now 2017 Conference in Indianapolis, ReSound’s VP of Medical Affairs Dave Fabry and Senior Audiologist Steve Hallenbeck gave a fine-tuning demonstration of the LiNX 3D. Using technology in the conference venue, Fabry and Hallenbeck made adjustments to a patient’s features and settings to ensure they were experiencing the best sound. What’s the catch? The patient was based in Copenhagen, Denmark! LiNX 3D is equipped with Smart Fit software and remote fine-tuning, which allows us – your hearing specialists – to make adjustments to your listening experience from virtually anywhere on the planet. After your initial fitting at Advanced Tech Hearing Aid Centers, you may notice that sounds are not quite as accurate when you enter real-world situations. While our specialists provide as accurate a listening experience as possible, there are fluctuations when you enter different noise environments. In these situations, tele-audiology becomes a useful tool. ReSound’s new software, Smart Fit and the Assist app, is cloud-based, which means you can send us a message from anywhere in the world to discuss changes you need, and we can fine-tune this adjustments from anywhere! For people with busy lives, this saves you a trip to our offices. The Assist app is a user-friendly platform that allows wearers to send requests and for hearing specialists to make adjustments and updates, which are then uploaded to the cloud and sent to your LiNX 3D hearing aids. This provides wearers with immediate access to accurate and excellent sound quality. 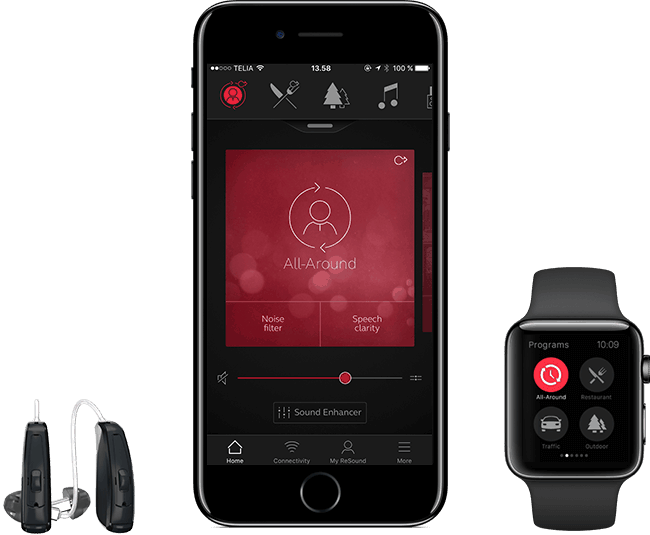 Assist also provides wearers the options to make simple adjustments on their own to their listening experiences Assist archives user preference settings and makes automatic adjustments as you move to saved environments. If you’ve ever lost your hearing aids before, you don’t have to worry with LiNX 3D! Assist is equipped with a tracking function to locate them – just one of the great features of a Made for iPhone hearing aid. Surround Sound delivers clear, rich, vibrant sound with exceptional speech understanding, which means LiNX 3D supports your brain’s natural ability to recognize the direction from which sounds appear. LiNX 3D’s directional microphones work together, automatically exchanging data and balancing sounds from your environment to provide you superior surround sound. LiNX 3D is also equipped with ReSound’s trademark Binaural Directionality III, which captures sound from all directions. 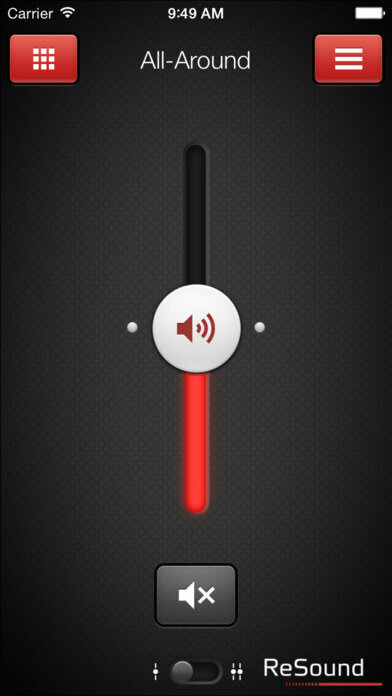 This is especially handy when it comes to speech recognition and speech in noise. LiNX 3D’s speech recognition features open up your focus within any environment, giving you control over the speech sounds you want to hear. LiNX 3D is a receiver-in-the-ear hearing aid, discretely designed to be just 0.82 inches tall. This sleek design ensures that it is virtually invisible and is a great choice for wearers who desire discretion with their devices. LiNX 3D is also available in behind-the-ear models, as well as a full range of custom styles (invisible-in-canal, completely-in-canal, mic-in-helix, in-the-canal, and in-the-ear), with customized fits available. ReSound’s Smart Fit and remote fine-tuning ensures heightened customization for your listening experience.